This is the first book, which would be reviewed on the site vitoshacademy.com. It is probably the best free programming book (as far as I have never heard of another free programming book) for C#. About 1000 of junior Bulgarian programmers have read the whole book more than once and have given some ideas for improvement. 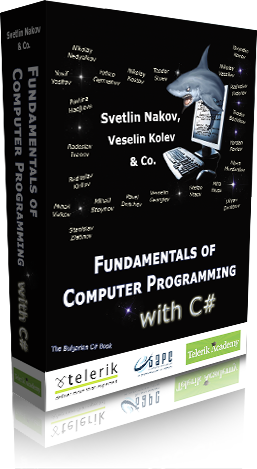 Thus, this book is something like the Bible of the Bulgarian programmers in C#, coming from the Telerik Academy. 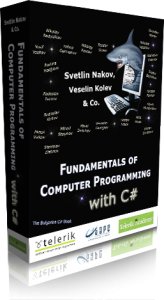 The book is not only about C#, it presents all the programming concepts behind this language, such as loops, arrays, conditional statements, methods, LINQ, etc. If you can make the tasks after each chapter, then you are probably a better C# programmer than 95% of the people, interested in this language and calling themselves programmers. Anyway, if you are not able to cope with the tasks after the chapter, you may take a look at the solutions at this web-site, in the section C# tricks – “first steps”, “second steps” and “third steps”. I am not ashamed to admit that some of them are not really mine, as far as I was also not able to cope with all of them. (thus I am obviously not in the top 5% C# programmers… yet!). In general, I have decided to give a code as an example for every book I review. The problem with this book is that almost every article, concerning C# on this site comes from it. 🙂 Thus, simply click on the menu at C# Tricks and see some of the code examples for the book. More will come, when I have more time & knowledge & desire to blog about it. For now, I have written articles about a good example of array usage, a random password generator, a simple checker for number type and e-mail extraction from text. The book makes really good examples for the principles of the Object Oriented Programming and thus it is a great help for any programmer, programming in any language. The way it describes the structure of the language is really clear and understandable. A minus is, that it is not really brief, but rather expanatory, with a lot of examples. So, if you are looking for something short & quick this is probably not your book. However if you are a beginner with desire to go deep, this book offers this possibility! So, here is the web-site of the book! If you want the whole free book in a PDF, you may click directly here!